Searching Tenders on Tradereader.com is very easy and fast. User has to provide a Basic key word of Product & services in a Main search box for which he/she is seeking Tender Information. TradeReader.com also provides facility for Broad Match through Word Search & Exact Match through Exact Phrase Search facility. TradeReader also helps user by providing better idea of his/her search results through Related Search functionality. 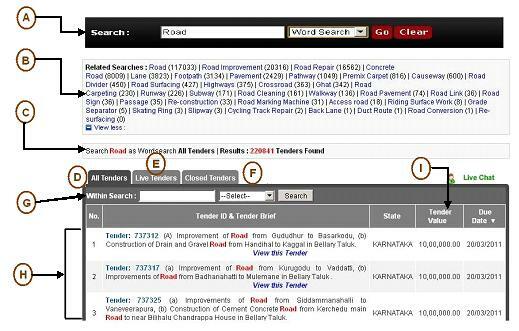 Appropriate search Message with Searched Tender Count is available for the user’s reference. The user also has the facility to view the search results by All Tenders, Live Tenders and Closed Tenders. TradeReader also provide facility to it’s users to Refine the search results through Word Search or Exact phase, Our Tender Reference No i.e TR NO, Ownership, State, Due Date of Tenders and Tender Value. TradeReader Provides brief Tender Notice, State, Tenders Value & Due date of Tenders in Tender listing section. It also provides facility to sort Tenders in any of the above criteria. G Within Search User can refine their search results further by providing following search criteria. H Tender Listing TradeReader provides Name of Work as Tender Brief, Project State, Last date of Bid submission as Due Date & Estimated Tender Cost as Tender Value in Tender Listing section. Searched key word is highlighted (marked Red). I Sort Tenders On. User has the facility to sort these Tender information in Ascending or Descending Order by Tender ID, State, Due Date, Tender Value.